The Reputable Fertility Clinic of Cyprus is the top fertility clinic based in Cyprus, pioneering the way ahead for North Cyprus IVF. This donor egg clinic carries a high reproduction success rate set in a laboratory environment, to have a baby. “At Cyprus In-Vitro Fertilization Clinic we are very proud of our high success rate especially when it comes to the fields of in-vitro fertilization, egg donations, sperm donation, embryo donation, and gender selection treatments. Each and every year our qualified team aids and assists hundreds of patients from Turkey, England, Germany, Italy, Russia, Spain, Scandinavia, Middle East and as far as Far Eastern countries to help achieve their dreams. Now it’s your turn”. As a recognized IVF specialist, Op. Dr. Tolga TUNA and his team conduct their infertility treatment methods at Cyprus In-Vitro Fertilization Center Nicosia, North Cyprus. And are steering the way ahead with advanced technology, expertise and care. A key reason for choosing Cyprus In-Vitro Fertilization Center is their excellent success rates for your treatment abroad. The success rates for 2016 for our donor egg patients show an impressive HCG pregnancy rate of 83%. The clinic carries out over 1,000 cycles each year. It’s success rate thrives on a more reliable prediction of success than many other fertility clinics in Northern Cyprus. Our Clinic has continuously adopted itself utilizing all developments and technologies worldwide in the in-vitro fertilization field and provides a special brandization of services for it’s discerning patients. IVF Specialist Op. 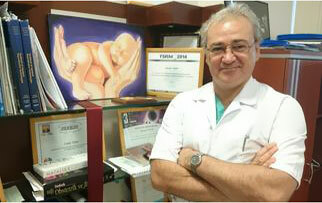 Dr. Tolga TUNA, and his team conduct their unique fertility treatment protocol and methods in Cyprus supporting patients at every stage of the IVF process. If your thinking of having IVF abroad please do not hesitate to make contact for a confidential chat. I am on call for Whatsapp/Viber, so your able to have a video chat too, if you would you wish to. Please call on the telephone number below. Alternatively email via our contact form for more information and the competitive rates. We look forward hearing from you.